BlueTrek has made an impact on European markets for some time now and is quickly finding a place across the pond. 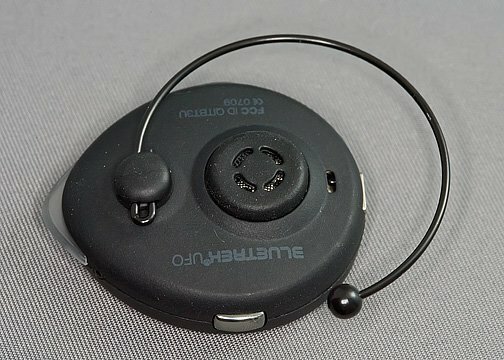 Their most unique headset may be the BlueTrek UFO Bluetooth Headset (84.95). 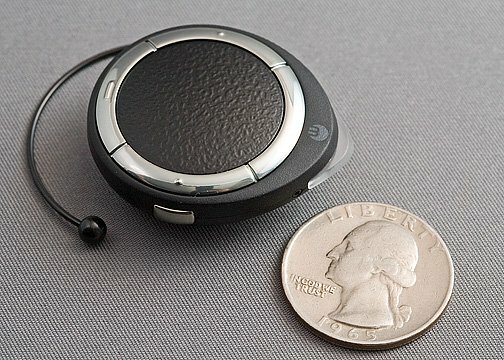 One of the smallest headsets around, its unique style is sure to turn heads. But does it have the function to back up its form? 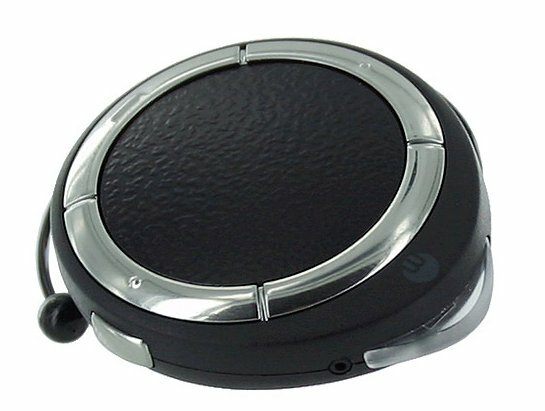 The UFO comes packaged with plastic and wired ear hooks of various sizes, a USB charging cable, wall charger and adapter to allow for car charging. The UFO weighs a paltry .23 ounces and is not much larger than a quarter. It uses a wire or plastic ear hook and rests on your ear, as opposed to in your ear. The hook keeps it snug and there was very little bounce to the fit. For such a small device, it has plenty of controls; five buttons on this tiny device. On the surface you have ring that includes the answer/end call button and two favorite number buttons. On the sides of the UFO, you’ll find the volume up and volume down buttons. At the tip of the UFO is a LED light that will flash blue or red to alert/confirm functions. The UFO also has Voice Alert that gives you an audio confirmation of functions. The UFO comes with a Quick Start Guide that will get you running but is difficult to follow for the UFO’s features. There is a full operator’s manual available online that gives much better directions. Pairing is not without challenges. With the UFO off, you press and hold the answer/end button for seven seconds. The LED will flash red/blue which confirms the headset is in pairing mode. You then have the phone recognize the UFO; enter the factory code and your in business. Due to the small size of the buttons, it’s easy to toggle the button while entering pairing mode, which will result in simply turning the UFO on and off. Reception between the phone and UFO is good. Every now and then I had a bit of static but I couldn’t tell if it was coming from the phone or the connection with the UFO. Call volume was really good and somewhat surprising due to the fact the UFO sits on your ear. The microphone had no problem picking up my voice using a normal tone and volume. The microphone also filters background noise really well. It almost completely filtered out the car stereo during conversations. The small buttons took a while to get used to. 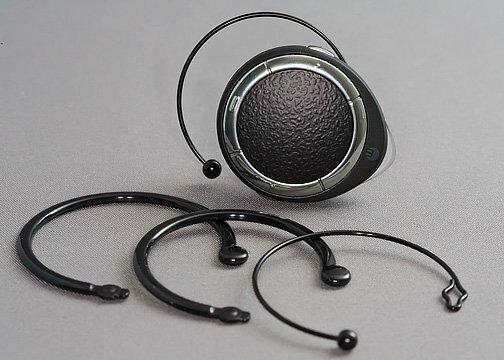 They are almost flush with the body of the headset making it difficult to distinguish. I would have preferred to see the buttons raised or maybe even have a multi-function button in the center of the device. The UFO has the standard features, some of which are phone dependant, including voice dialing, last number redial, reject call, call mute and call waiting. The UFO has two buttons that are dedicated as “favorite numbers”. In essence, they are speed dial buttons. Directions for programming them are difficult to follow in the Quick Start Guide and not much easier in the full manual. You have to rename your phone using a syntax and then press and hold the volume down key to store the number in the headset. It may sound straight forward to some users but to the novice, I could see this giving them fits. I did like the Voice Alerts. When the UFO established connection a female voice would announce “Connected” and if I lost the Bluetooth signal it would tell me “Disconnected” and a tone would sound. I would have rather seen an easier way to store numbers in memory but the Voice Alerts is nice window dressing. Battery life is reported to be approximately 6 hours of talk time and 8 days of stand-by time. Battery life during the review supported these estimates and combined with the charging options BlueTrek provides, battery life should not be an issue. I grew to like the BlueTrek UFO Bluetooth Headset (84.95). It was comfortable to wear, had good reception and call quality, and wasn’t overbearing. I do wish the buttons were easier to use but it developed into more an issue of getting used to them as opposed to being poorly designed. I still think they could be raised a little but as is, you get used to them. The UFO is sure to turn heads both in appearance and performance.